The womens groups we serve are always looking for new and innovative projects to undertake to improve their economic situations. They often ask for our advice, especially in between harvest seasons when there is little farm work to do and options for earning income become few and far between. We recently had a few volunteers who, when asked for assistance, offered to help the women start small crêpe and donut businesses. Many of the members of local womens groups are elderly and find it hard to work long days on farms or washing laundry, housecleaning, or caretaking for children, all common options for earning income. Shorter days with physically easier work is greatly appealing to these women and they jumped at the opportunity to start baking businesses where they need commit just a few hours of baking in the morning, and a few hours of selling their products in the afternoon. Crêpes and donuts are ideal products for the women to sell as, not only is demand from local school children and their teachers is high, but the start-up costs of such enterprises are minimal. 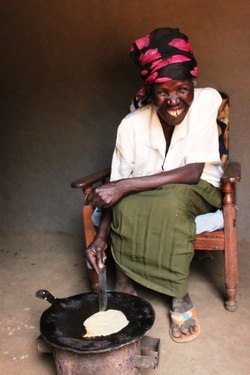 Most women already have a "jiko" - a local type of stove pictured here, and a "chapati pan" - also pictured here. They only need to purchase ingredients and charcoal in order to start their business, and one batch of crêpes, charcoal included, costs only approximately $1.40 to make, and a batch of donuts doesn't cost much more. The women then take their products to nearby schools and markets and sell them there. Margaret, pictured here, has started one of the most successful crêperies so far, earning twice her input cost with every batch she makes, and earning more with 5 or 6 hours of work than she was earning working 12 hour days washing clothes and taking care of children. We would like to thank our volunteers for making these microenterprises possible.